Generac is excited to bring you two new products for 2014 the Wireless Local Monitor (#6664) and the Liquid Cooled Wireless Local Monitor Adapter Kit (#6665). This new, sleek design provides three different, bright LEDs for generator status annunciation and three times the signal strength compared to previous models. The transmitter and receiver are both paired from the factory so no field syncing is required. The unit is compatible with all air cooled product(s) going back to 2008 that utilize the LCD text display and any liquid cooled or diesel product that utilizes either the Nexus or Evolution controller. Please make note, that for liquid cool or diesel applications the adapter harness is required. With the launch of these two new items, also note the Basic Wireless Remote Monitor and QT Remote Monitor Adapter Kit are now obsolete. 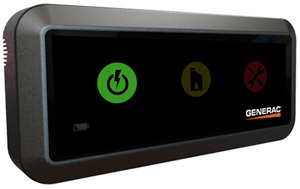 For more information on the new remote monitoring products, view the spec sheet here. Note: The Basic Wireless Remote Monitor (model # 5928) and the QT Remote Monitor Adapter Kit (model # 5958) are now obsolete.